Summer is here and it's time for garden parties, picnics, and outdoor Bar-B-Q's! 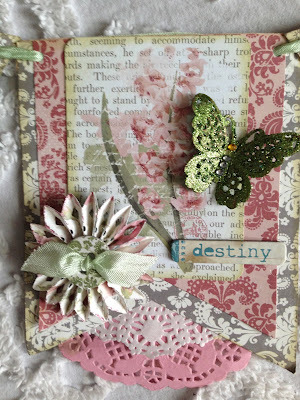 Bo Bunny's "Garden Journal I want it All Bundle" by FotoBella? 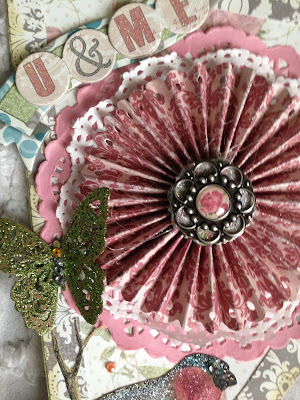 This Banner came to be as a result of a contest I held with the members of my awesome swap group Chic Craftique! "What would YOU create if you could use all these awesome products?" I received a lot of really great ideas and the winning idea was by Julie Monroe, who suggested making a summertime BANNER! This banner was made using the Garden Journal "I want it All!" Bundle plus a few other supplies from Bo Bunny and FotoBella. Note: To purchase any or all of these supplies just click on the highlighted word and it will link you to the website! Now, on to the BANNER! The first flag I made was the centerpiece. 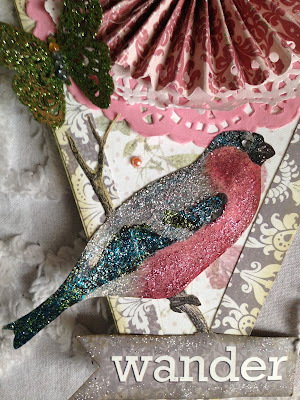 I used a bird image from the paper collection, fussy-cut it out, and painted it with Bo Bunny's Glitter Paste. The left photo shows the FLORET I made using my own scoring board and bone folder. (Please refer to the tutorial on the FotoBella Blog from May 26th) The right photo shows a bit better the sparkle and shine of the Bo Bunny Glitter Paste. 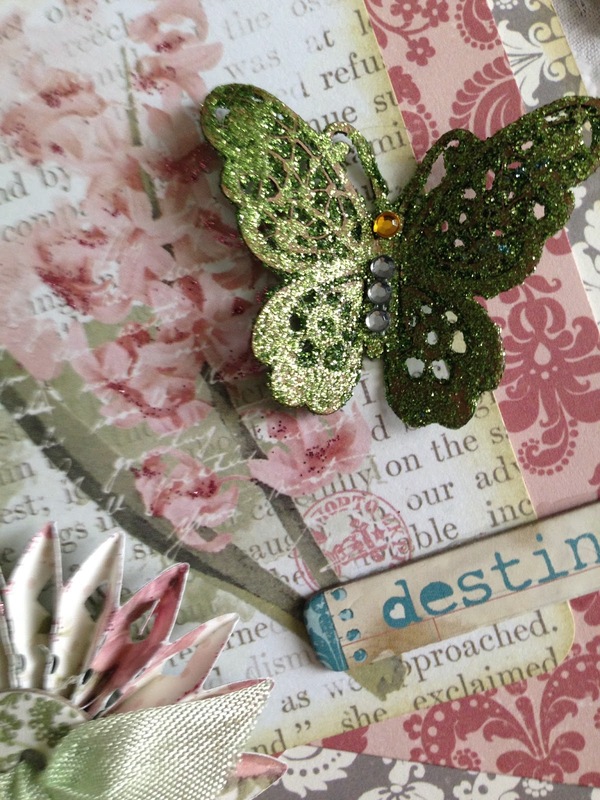 I also used it on the Laser-cut Butterflies! SO Pretty! On each side of the center pennant I hung a flag. Chipboard sentiments from the Bundle and more florets embellish the flags. 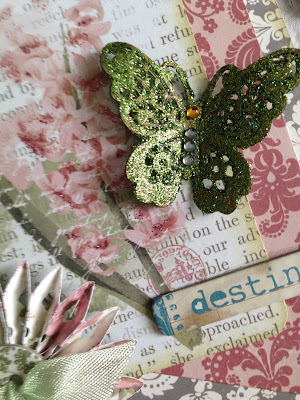 I embellished the butterflies with bling from the Bundle. 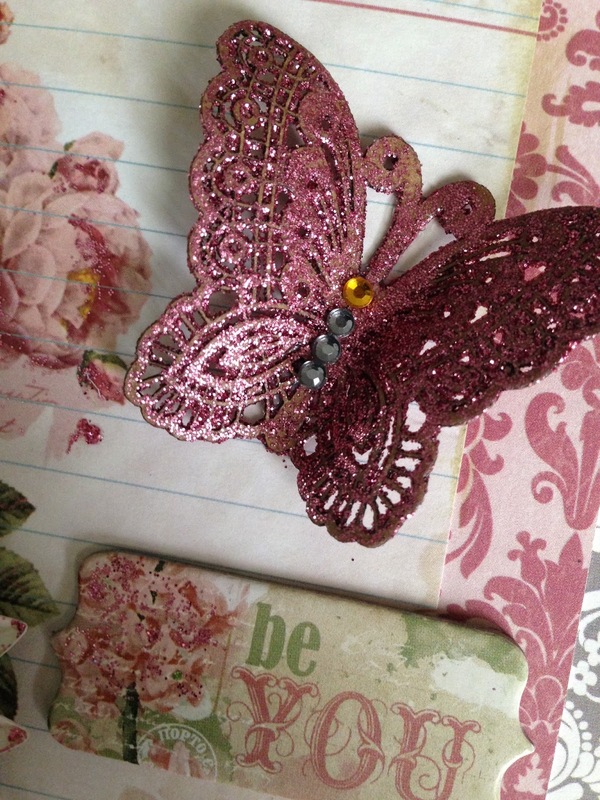 Above you can see how very shiny and glitzy the glitter makes the butterflies! Two doilies hang at the bottom of the flags. 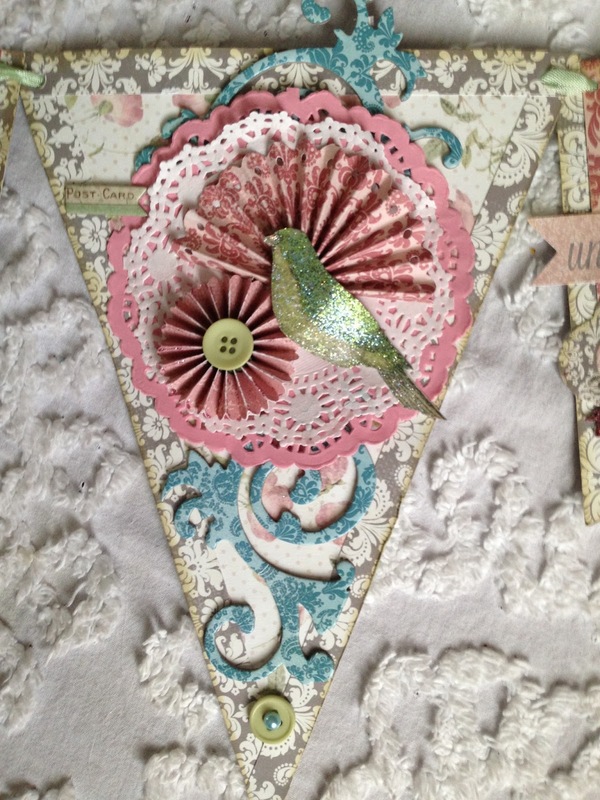 Another pennant and flag embellished with florets, doilies, chipboard sentiments and butterflies. I decorated the outer pennants with chipboard swirls, which I cut in half, then adhered to each. 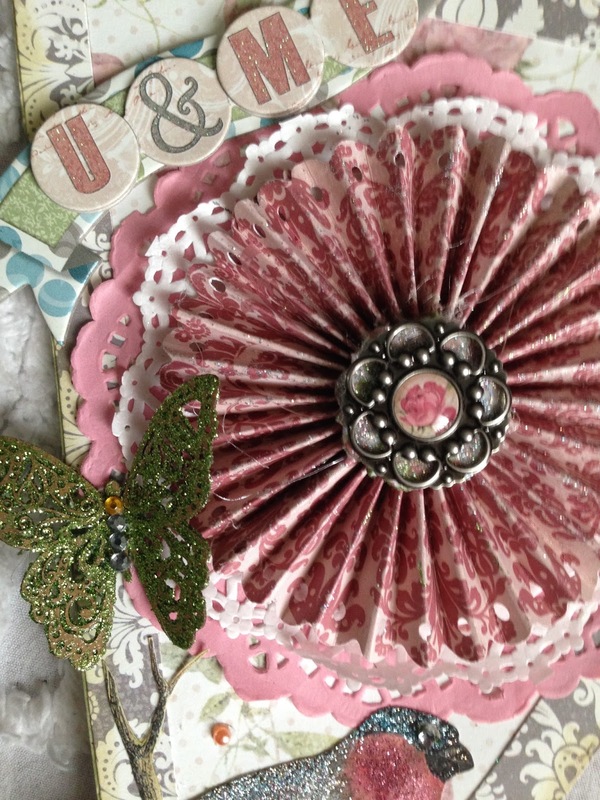 Doilies and florets complete the look. 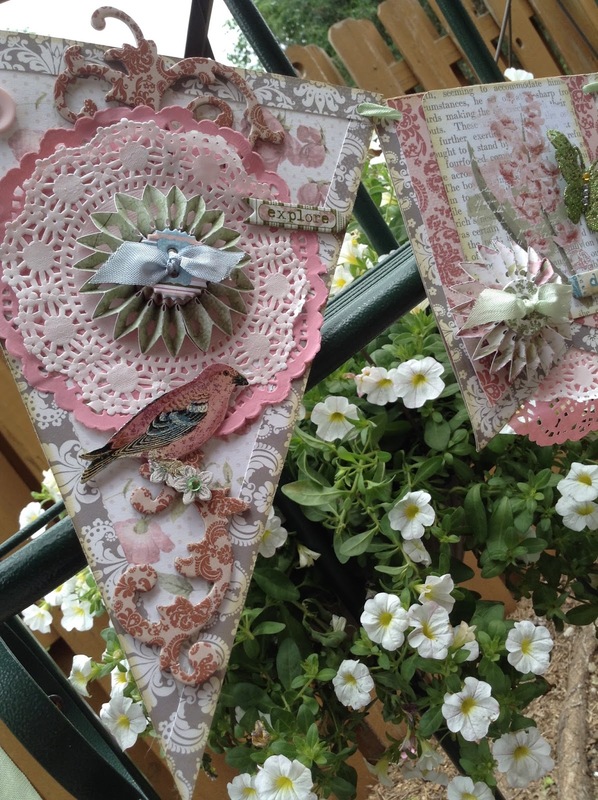 Each pennant featured a bird, and each flag a butterfly. This is a close-up of one of the 2 end flags. They were slightly more narrow than the flags in the center. Here you can see the other pennant, where I used the other chipboard swirl, again cutting it in half and adhering. Instead of a large floret I made a fan and a small floret and placed a glitter-painted bird on top. Here are two close-ups of the pennant. Love that Glitter Paste! Another flag, and you can see that I used the same format for all. This Banner is so pretty and will be perfect for any outdoor venue! Try making one yourself! It's fun! This is so beautiful! You have such amazing talents Renae! Thank you Stacy! Welcome to the FotoBella blog! I'm glad you like my banner! 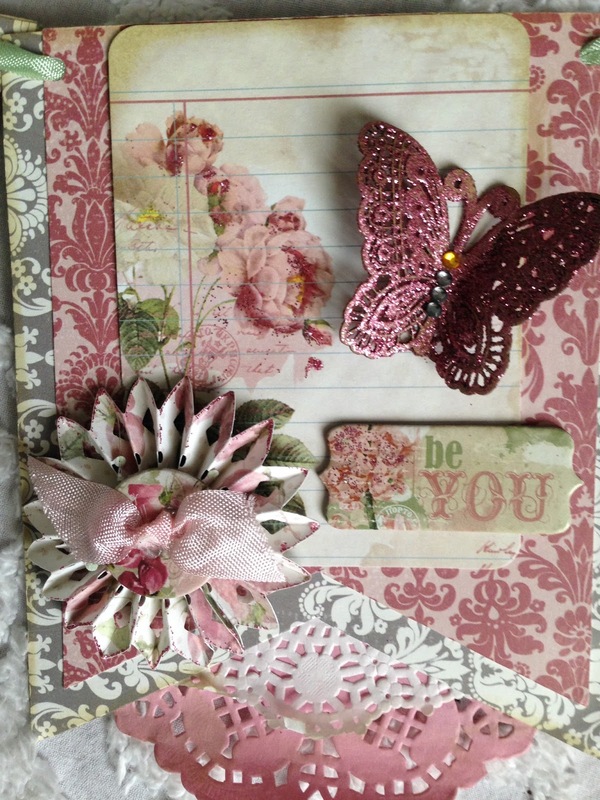 You would also be inspired by the FotoBella Design Team! If you get a chance, scroll down and see some of the amazing creations made by Jeri, Apryl, Jessica, Drea,and Sarinda! What a gorgeous banner! Absolute perfection! This collection is to die for! Congratulations to lucky Julia! I had so much fun making the Banner, and by using the Bundle, I had plenty of paper and embellishments to make several other projects! Thank you, Marisol! How sweet of you! Kim, the Glitter paste is an absolute blast to play with! The colors are just brilliant, and they dry quickly and retain their brilliance! Trying to post yet again...This is beyond awesome!!!! I am drooling,lol The butterflies are to "die" for,no pun intended,lol..I would display this piece of gorgeous artwork proudly!!!! LOVE ❤️😍it and you...You are so talented and creative..You are an inspiration...Thanks for sharing..and Great suggestion Julia!!!! Thank you Linda! The Butterflies are beautiful, you are so right! 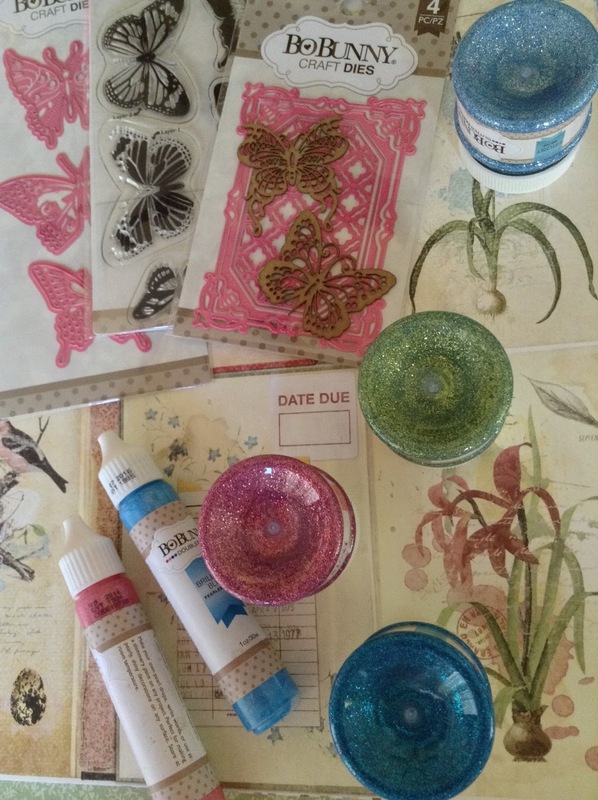 It's not hard to make beautiful projects when you have all these fantastic products at your fingertips! Renea this is AMAZING. I adore your projects. thank you for sharing. Thanks Mike! So glad you stopped by! ReNea, your banner is absolutely amazing! TFS your talent! 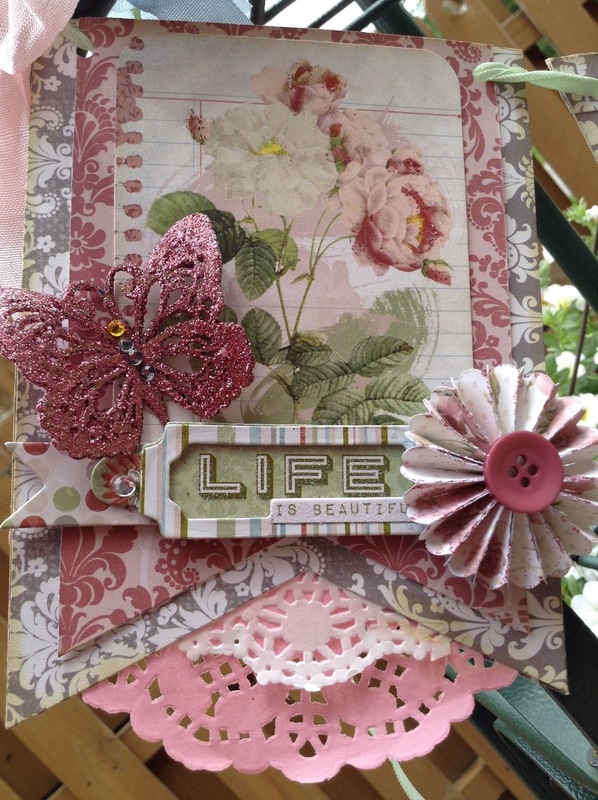 Sabrina, seriously it's easy to make amazing projects when you have all these wonderful embellishments, paints, stamps and dies...and the PAPER. To die for!! I think this is really cute, RaNae. 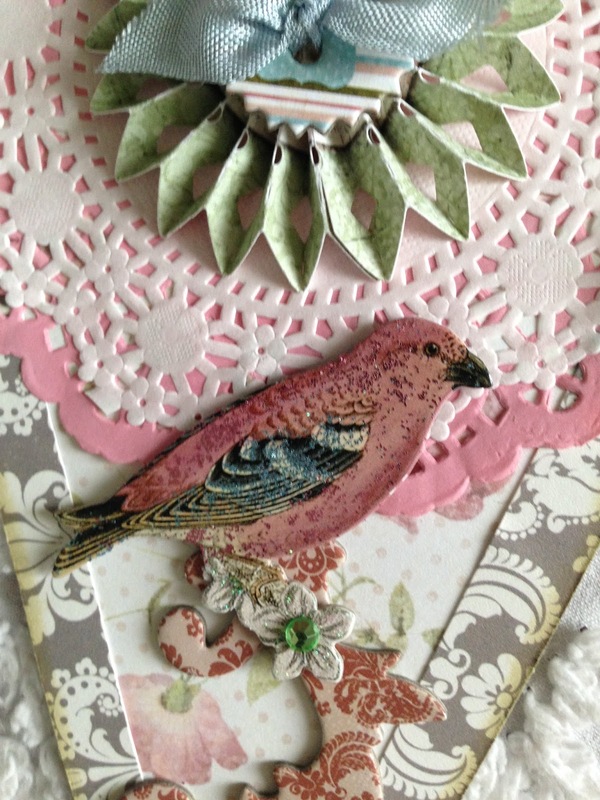 They remind me of ATCs. What's a summer banner? Just decoration? A summer banner is used for decoration at any number of venues, from a birthday party to a graduation to a barbecue! It's a fun and festive way to decorate your outdoor get-togethers! I was so lucky to get to see this banner in person and I was floored. Looks like it was great fun to make. ReNae you are so talented. Oh Linn, You're too kind! These products look absolutely amazing . Hope to get the chance to play with some of them. They look super easy and beautiful. I hope you do get a chance to get some! I would highly recommend the Glitter Paste. 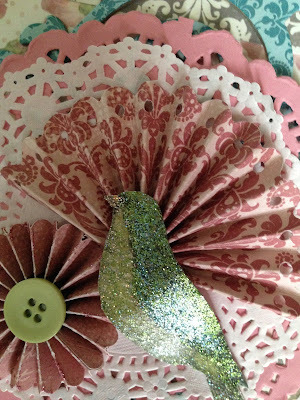 It is so fun to use and adds sparkle and shine to any project! Just get the Bundle from FotoBella and it's easy!